ALIVE Associate: ASSOCIAZIONE EDUCATIVA ITALIANA "VIVERE I VALORI"
LVE is active in several regions of Italy. Mrs Daniela Mascotto, a graduate in education, contributed the following about the two LVE projects carried out in Tribano during 2008. The first LVE project was done with 22 children ranging from 3- to 9-years old. “At the Summer Holiday Centre, the teachers implemented some LV Activities every day, within the normal activities of the centre. That included visualizations, reflections, communication, listening, concentration, leisure and artistic activities aiming at improving both the socializing aspect and the personal skills by enhancing the inner values of each child. Such values as peace, love, respect and unity were particularly worked out. Results: At first, the most restless kids tried to fill the empty spaces created by the moments of silence with bursts of laughter and words, but after a few days they became quieter and more willing to relax. Within the activities about peace, respect and love, even the children showing more aggressive behaviours could discover a new way to come in touch with the others, a more positive social communication approach, a better listening ability and a more selected vocabulary. On the other hand, the most introvert and shy ones improved both their self-esteem and self-respect which had a consequent effect in the quality of their ways to relate with the others. Children seemed to be more capable to come in touch with their inner values and speak about them. The activities included in the Unity session were such that they helped to create a harmonious group, in spite of the different ages of the children and the schools they came from. The activities also included daily meetings with the parents, who were stimulated to reflect upon this kind of education. In fact they had already caught its positive effect and often wondered about the good changes in the behaviour of their children and the atmosphere brewing in the Summer Centre. “The second project was developed during the whole 2007/2008 school year with a group of children attending a private nursery school from 3- to 6- years old. As their educator, I had the opportunity to realize the great importance of a kind of education based on LVE principles not only in favour of the children’s intellectual, emotional and spiritual growth but also of their health thanks to the harmonious balance they create on the body wellness. All 11 values were included among the various teaching activities during the whole school year. Anna Cenci, a Montessori School of Gubbio teacher, and Sandra Baldi, teacher and LVE trainer, reported that they have conducted four monthly meetings with parents on the values of peace and respect. Three additional meetings were held with teachers working on the same values. All were facilitated by Sandra Baldi. Anna Cenci conducted classroom visualizations using the values of peace, which included drawing activities. These activities were part of the daily curriculum for about a month during Christmas time (2007). Based on these activities, a DVD has been produced, narrating the journey to a peaceful space, with the voice of the teacher as background and the drawings as focus. Stories and other LVE activities were implemented during the rest of the academic year. 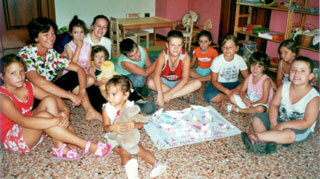 the second was developed in a nursery school with children ranging from 3 to 6 years old. A third project took place in Lecco as a training workshop for nursery and primary-school teachers. 1. At the Summer Holiday Centre, the teachers incorporated some LVE activities everyday within the normal activities of the centre. The LVE activities included visualizations, reflections, communication, listening, concentration, leisure and artistic activities focused on improving both socializing abilities and personal skills by enhancing the inner values of each child. Such values as peace, love, respect and unity were particularly effective. Results – At first, the most restless students tried to fill the empty spaces created by the moments of silence with bursts of laughter and words, but after a few days they became quieter and more willing to relax. Within the activities about peace, respect and love, even the children showing more aggressive behaviours discovered a new way to interact with the others, a more positive social communication approach, a better listening ability and a more appropriate vocabulary. On the other hand, the most introverted and shy ones improved both their self-esteem and self- respect which enhanced the quality of their ability to relate with the others. The children seemed more able to come in touch with their inner values and discuss them. The activities included in the Unity session, helped create a harmonious group in spite of the different ages of the children and the schools they attended. The activities also included daily meetings with the parents who were inspired to reflect upon this kind of education. In fact the parents had already experienced the positive effects and often wondered about the good changes in the children's behaviour and the atmosphere created in the Summer Centre. The above experience shows how important it is for a teacher involved in the process to create an atmosphere based on the LVE principles. The results will be greater and more immediate when the children involved are very young as they tend to absorb and imitate what comes to them through their environment. That is why it is important to apply the LVE program starting in nursery school. But, as an educator, I feel that it is even more important to include the parents in the LVE program as well. The parents are their children's first educators and influence their children's development which is not only physical but also intellectual, emotional and spiritual. 2. The second project was developed during the entire 2007/2008 school year with a group of children attending a private nursery school. As their educator, I recognized the great effect an educational program based on LVE principles has on the children. The LVE program positively impacts the children's intellectual, emotional and spiritual growth as well as their health thanks to the harmonious balance the values create on body wellness. All the 12 values were included among the various teaching activities throughout the whole school year. The outcomes from this kind of work have been excellent, resulting in great harmony in the children's relationships among themselves and with their teachers. However I do believe that such positive results are possible because of the involvement and cooperation between parents in the LVE program. In fact, the parents took an active part by meeting monthly during the entire school year. This also shows the importance of the cooperation between teachers and families in the educational process which is made possible thanks to the acceptance of education rooted in the sharing of common values. In this way, the LVE program becomes a self-educational process for adults, both teachers and parents, who jointly cooperate in enhancing the development of the children's individual skills. This partnership enables the children's free expression of such innate values which are core to a civilized society. This positive educational experience will influence the children as they grow into future adults. Considering the positive results achieved, both parents and the teacher agreed to continue the LVE program for the 2008/2009 school year. 3. A third program including a training workshop was conducted in Lecco for a group of nursery and primary- school teachers. The group of people involved in the LVE program in Greve (Chianti) is formed by six primary- school teachers, by Maurizia, who also makes the Mulino di Botti resort available for residential workshops, and Jessica, who coordinates the activities. Even though their meetings were occasional and informal during the last school year, the group has become more united over the years. Thanks to their common experiences, they have included activities aligned with the LVE spirit at each of their work sites. Last spring, a few teachers went to Salerno (near Naple) to arrange a training workshop for the teachers of the primary school of Capaccio. In May with Jessica, a residential workshop was organized by the Mulino di Botti in Panzano (Greve in Chianti) which was attended by teachers coming from Salerno, Gavirate and Omegna (Piedmont region) and also by parents and teachers of Greve. The Town Hall Council sponsored the event and provided the meals to all the participants. The teachers of Salerno might send a briefing and some photos. Sandra Baldi reported that Peace, Respect, Love and Tolerance have been the topics of some programs at the BK Centre in Rome. Quite a good number of teachers partcipated. Eraclea (VE) Ottobre 2003 - Sue Emery di Londra ha condotto una giornata di formazione con 35 insegnanti e una presentazione presso la sede del comune alla presenza del sindaco e di altre autorità locali. Hanno seguito altri 3 incontri di formazione con un gruppo misto dei genitori e insegnanti. Un incontro per il pubblico ha portato in contatto 26 genitori che hanno partecipato in modo allegro ed entusiasta. Jesolo (VE) dopo la presentazione, due scuole dell'istituto comprensivo si sono sottoposte ad un corso di formazione con 110 insegnanti nella prima e 66 insegnanti nella seconda. A novembre, sempre con Sue di Londra, si è iniziato con una scuola materna, elementare e media. 34 insegnanti si sono incontrati per una intera giornata. Ambedue genitori e insegnanti sono molto interessati a continuare. Milano – Una giornata di formazione è stata condotta a Milano da Sue Emery e Monica Tyler presso la British School - The Sir James Henderson. La scuola aveva già un alto orientamento ai valori e avendo studiato ViV hanno deciso di utilizzare le attività offerte nel ViV per incrementare maggiormente la consapevolezza negli insegnanti e bambini su come applicare i valori nella loro vita. Circa 35 insegnanti di materna e elementare hanno preso parte alla giornata. ViV è stato ufficialmente incluso nel loro curriculum, integrando alcune idee di ViV nel loro IB (International Baccalaureate). Relazione sul progetto "Vivere i Valori"
incontri mensili, rivolti a insegnanti e genitori, coordinati da Jessica Martensson, responsabile ViV per la Toscana, e guidati da operatori che gratuitamente hanno offerto il loro contributo. Il tema scelto per l'anno in corso è stato l'ASCOLTO. Agli incontri hanno partecipato insegnanti dei tre ordini di scuola e, in media, una decina di genitori a incontro. Tutti gli incontri sono stati incentrati su attività pratiche, il progetto infatti privilegia l'esperienza personale come strumento e metodo di conoscenza. Il primo stage guidato da Pilar Quera si è tenuto presso la scuola elementare di San Polo nei giorni 28-29-30 Novembre. Le sessioni di lavoro si focalizzavano sulla pratica dell'ascolto: ascoltare se stessi, ascoltare gli altri, ascoltare e interagire con il mondo che ci circonda. Il secondo incontro si è tenuto presso la sede dell'Associazione "Mulino di Botti" nei giorni 6-7-8 Maggio e vi hanno partecipato anche insegnanti provenienti da altri Circoli Didattici (Omegna, Gavirate, Paestum e Capaccio) interessati a conoscere il programma ViV e che, a loro volta, hanno presentato i loro progetti più significativi. Breve presentazione del progetto e delle persone presenti. Attività pratica sull'ascolto in piccolo gruppo (tre persone a rotazione parlano, ascoltano e osservano), condivisione con il gruppo allargato dell'esperienza e individuazione di quelli che sono per ognuno dei presenti gli ostacoli maggiori per un ascolto autentico e profondo. Si riporta l'elenco: rigidità, frettolosità, ansia, non vivere il momento presente, presunzione, invadenza, essere concentrati sul proprio pensiero, scarsa empatia verso chi parla, voglia di intervenire sul discorso dell'altro e comunicare la propria esperienza. Giovedì 4 Dicembre 2003. Incontro guidato da Anna Caini, conduttrice di gruppi di "Attività Integrata". Attività pratica sull'ascolto dell'altro e sulle proprie emozioni in una relazione. Giovedì 8 Gennaio 2004. Incontro condotto da Wanda Berton, insegnante elementare. Giovedì 5 Febbraio 2004. Incontro condotto da Marcella Dondoli, psicopedagogista. Riflessione sull'importanza della comunicazione corporea nella relazione con i bambini sia come attenzione al proprio atteggiamento gestuale che a quello degli alunni. 1^ esercizio. Mimare a coppie un episodio o uno stato d'animo della giornata. A fine esercizio individuare gli ostacoli e i facilitatori nella comunicazione gestuale. 2^ esercizio. A turno i componenti del gruppo stringono la mano agli altri bendati. Condivisione dell'esperienza. Giovedì 4 Marzo 2004. Incontro condotto da Tania Casalzoli, conduttrice di gruppi di Brain Gym. Attività pratica per affinare la capacità di ascolto attraverso le tecniche del Brain Gym, che aiuta il coordinamento dei due emisferi cerebrali, con movimenti per l'integrazione corpo-mente. Giovedì 4 Aprile 2004. Incontro condotto da Jessica Martensson. Riflessione finale e valutazione dell'attività svolta durante l'anno. Irgoli (Nuoro) Alessandra Lai ha condotto 3 mesi di incontri a cadenza settimanale in una scuola elementare e ha riscontrato un responso oltre le aspettative. Bambini demotivati e anche insegnanti che avevano poca disponibilità ed apertura hanno cambiato idea e adesso si chiedono quando ViV può continuare. 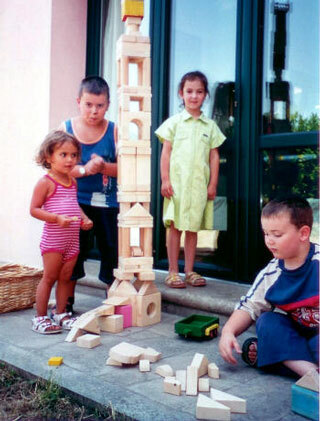 Un bambino tra i più demotivati ha commentato: "All'inizio pensavo che era una perdita di tempo, ma poi ho scoperto che era un cosa bellissima, preziosissima, soprattutto per me stesso ed infatti lo era. E' la cosa più bella che abbia mai fatto soprattutto perché era fatto con amore dalla maestra per la quale ho molto rispetto". Tribano (Padova) – Daniela Mascotto, educatrice d'infanzia, sta insegnando in una scuola comunale solo estiva, e ha trovato particolarmente utili i giochi sul rispetto. Il programma è stato concepito per studiare ed esplorare in modo dinamico e costruttivo, sia i propri valori che il rapporto con l'intera comunità. Alcuni esercizi in particolare erano mirati ad accrescere l'auto stima, la capacità di intrattenere una comunicazione sociale positiva, il pensiero critico, l'espressione creativa. Mediante esercizi e domande si osservano gli effetti delle proprie azioni sugli altri e le conseguenze di tali posizioni e scelte. Ad esempio, nella sessione sull'Onestà, si improvvisa una recita sul tema onestà/disonestà, rifacendosi ad un contesto di studi storici o sociali. Si osserva anche il nesso esistente tra cupidigia, corruzione e la negazione dei diritti umani. Nella sessione sulla Semplicità, si esamina l'impatto dei mass media e della pubblicità. Le sessioni sulla Tolleranza, Cooperazione e Unità, ecc. introducono degli elementi di responsabilità sociale. Utile e stimolante ideare un progetto comune. Vedere "Partecipazione dei giovani e bambini" per la citazione di alcuni lavori ed esperienze. Gubbio – La maestra Nicoletta Sensi, che è stata una delle prime ad utilizzare ViV, ha creato una casa laboratorio dove svolge attività volte allo sviluppo della creatività sia per adulti che per bambini. E' una fattoria didattica che ha scelto di avere i valori come pilastro educativo e su questo hanno basato ogni loro attività. Integrando la danza, il teatro, la pittura hanno realizzato che con i bambini è fondamentale avere come sfondo integratore un impianto pedagogico fondato sul lavoro dei valori. Biella (Torino) – L'intero circolo didattico ha seguito un corso di formazione lo scorso anno e durante questo inverno i 30 insegnanti hanno sperimentato vari attività sui valori nelle loro classi. La maestra Nicoletta Botto, che ha preso parte anche allo scorso TTT, ha commentato: "Da quanto abbiamo inserito ViV ci sono evidenti miglioramenti nel comportamento dei bambini e nella gestione dei conflitti. Non so quantificare le attività sui valori perché permeano il nostro comportamento e la qualità di interazione con i bambini". Forli – Corso di formazione per un piccolo gruppo di psicologi e volontari che sono dediti ad attività di formazione per giovani adulti, organizzato dalla cooperativa sociale Risorse Cittadino. Eraclea (VE) October 2003 - Sue Emery from London conducted a day's training with 35 teachers, and an evening presentation of Values in Education was also held in the local municipal town hall in the presence of the Mayor and other local dignitaries. Sue subsequently conducted 3 consecutive trainings with a mixed group of parents and teachers. A public event brought into contact around 26 parents who participated with much enthusiasm. Jesolo (VE) January 2004 - 2 different comprehensive schools had a presentation of LV for about 170 teachers in total, which followed with a one day training for 34 representatives from the 2 schools. Both parents and teachers are very interested to continue with the programme. Milano – A one-day training took place in Milan with 21 participants conducted by Sue Emery. The British School of Milan- The Sir James Henderson - was presented with the LVEP by Sue and local coordinator Monica Tyler. The school has a high set of values and having studied the LVEP decided to join the programme using the activities offered in the LVEP to further increase the awareness in teachers and pupils of how to apply the values in their daily lives. Around 35 teachers from the Kindergarten and Lower School took part in a one-day training and for this school year they have included the LV programme in their curriculum. The International School of Milan are considering how to integrate some of the ideas of the LV into their IB (International Baccalaureate) curriculum, since the two are complementary. The headmaster Mr. Terry Heywood has indicated to us the forthcoming conference on Education in Dusseldorf - see www.intedalliance.org -suggesting that someone from the LVEP may like to attend. Monthly meetings for teachers and parents with Jessica Martensson, responsible ViV in Tuscany. The theme of the year was LISTENING; teachers of different schools have been attending. The first stage with Pilar Quera, November 28-29-30, was focused on listening to the self, to others and the world. The second stage held at "Mulino di Botti" May 6 -8, also included teachers coming from different cities who were interested in knowing about LV. They also presented their own projects. Irgoli (Nuoro) Alessandra Lai worked for 3 months, once a week, in an elementary school and the results were much more interesting than what she had expected. Children who hadn't been easily motivated became very alert during the programme. Teachers too, from being a bit distant, became very open wanting now to continue with these ideas. A child said: "At the beginning I felt this was a waste of time, but then I discovered that ViV was a very beautiful thing, precious, especially for myself. It has been the most beautiful thing of my life, as it was conducted by the teacher with love and so I have a lot of respect for her". Tribano (Padova) – Daniela Mascotto, educator, is teaching in a council school for summer activities and she found the games on respect very useful as children were quite violent in their interactions. Last year, with Nikki from Toronto, we met the professor responsible for the faculty of pedagogy at Bologna University (He is also responsible of the orientation of pedagogy nationally – writers of University text books). A programme was therefore requested and was conducted with students in their final year of 'the scientific study of educational training'. 23 young adults attended the seminar for 16 hours. The Programme was a very powerful experience as the participants' response was very positive and they were very much involved. During an examination, and as feedback to the Professor (who is officially responsible), the students were so enthusiastic about the programme that it will be repeated next year. So a new door has opened and as most of the students are teachers or educators, they have already begun to implement some of the ideas at their workplace. One of the students will also do a thesis on LV. Gubbio – Nicoletta Sensi, was one of the first teachers to use LV in Italy. She is managing a kind of laboratory house where education and creative activities for children and adults are conducted. Values are the educational pillar of her work, using also arts like dance, acting and painting activities to implement the experiences of values in practice. Biella (Torino) – After an LV training last year, 30 teachers have been implementing LV in their classrooms.